My mom is notorious for the near-daily trips to the store to pick up a forgotten item. We’ve all done it. But what if there was a bank mix-up and you couldn’t use or access your account to shop? Or the security guard accompanies your boss to the cubicle with a complimentary cardboard box to fill with your stuff? What if a storm, civil unrest, or even a power outtage prevented that trip to the store? With more scenarios that the ones listed above playing out across our nation daily, it’s just reasonable to know that there is something set aside for a rainy day. Your grandma (or great-grandma) would approve. Such common sense made root cellars commonplace. Let Pantry Paratus help you! Get your free Annual Pantry Checklist here, to help you rotate out your food storage. Food rotation is key to knowing what you have, and to using it all in a timely way. 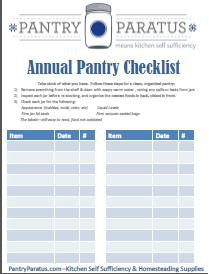 Click Here to Download the Pantry Paratus Annual Pantry Checklist.